You may see that every one is now using responsive web design. And with the evolution of this design trend, various techniques have also been developed to make responsive design user friendly, attractive and interesting. One of the most popular thing what designers use is the sliding drawer navigation menu. By default, this meny is hidden except the button to activate it. Clicking on that button will open the menu by pushing the current page. If you also want the similar kind of effect, you do not need to code it. There are various opensource Sliding Navigation Menu plugins are available. In this post, we are listing 10 best sliding Navigation menu. Just download one which matches your interest and use. Shifter is a cool sliding navigation menu jQuery plugin. It adds a push slide navigation in your web page. Use of the plugin is also simple. Plugin is opensource and free to use. 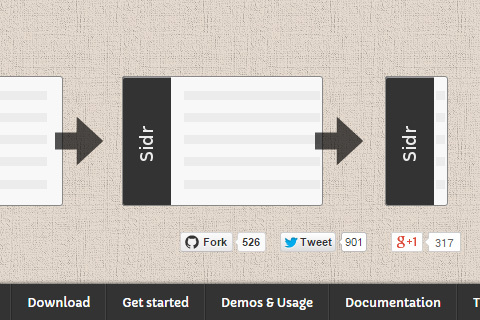 This is another cool responsive multilevel slide in menu plugin. It comes with attracive sliding effect and layout. I am sure you will like this plugin. BigSlide.js is another similar kind of jQuery plugin which lets you add a sliding side navigatio in your website. Use of the plugin is very simple. You only need to call a jQuery function on your menu. Sidr is another popular jQuery plugin to add side menu which is responsive and good looking. Pikabu is speedy and flexible jQuery plugin to add a responsive sliding menu in a web page. It is super customizable with easy to understand code. Responsive Nav is another nice jQuery plugin which lets you add cool navigation in your website. Clicking on menu button will slide the menu from the left side. Multi-Level Menu is another opensource navigation plugin. It also supports older browsers such as IE8. SlickNav is multi-level, simple,flexible and cross browser compatible jQuery plugin to add navigation in your website. You only need to include CSS and jS files to use this plugin. It is also impressive plugin which can add sliding navigation in both side of the web page. jPanelMenu is very similar to snap.js in terms of working. It is also very simple to use and customize.